From Jazz to the Blues, Garage Rock to Punk, Hip-Hop to Techno, and the Symphony to good old fashioned Rock & Roll, Chattanooga has always been a hub for the creation of music. Our rich musical legacy and vibrant musical presence is inarguably one of Chattanooga’s greatest assets. Despite this, the artistic culture and music industry have been largely untapped in the Chattanooga area. While this industry generally has a contentious history when it comes to artist empowerment, its presence in a city provides a more organized infrastructure of supportive services that allow artists to aspire, develop, achieve, and stay. It is this infrastructure of artist support that Dynamo Studios aims to further develop and we believe the foundation of that infrastructure is organized collaboration and cooperation between Chattanooga’s emerging creative industry professionals, Hamilton County Schools, and the other innovators within Chattanooga. Our cooperative ecosystem represents a new think-tank or collaborative model for realizing creative and commercial success in the music industry or any other modern creative industry. 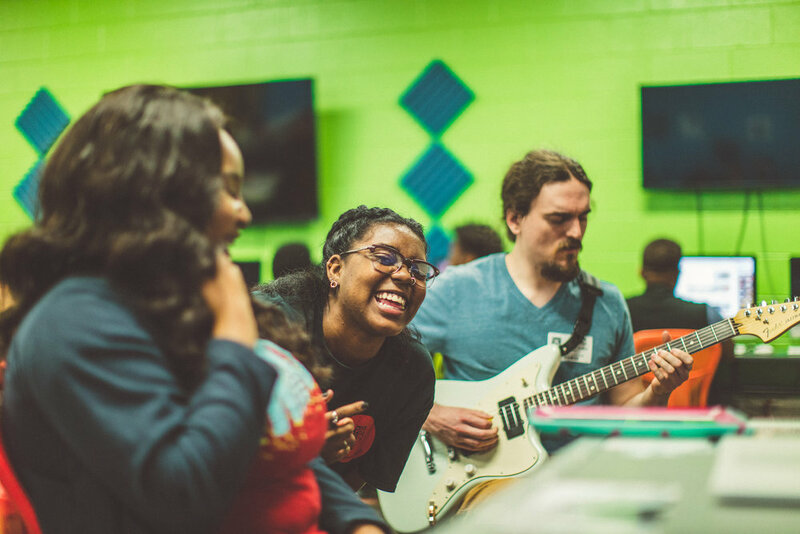 Chattanooga is in the position to shape the future of music and the creative economy when it comes to the creation of music or media, and we believe it should be equally future-oriented when it comes to the music industry and the greater creative economy. When properly scaled, Dynamo Studios will play a central part of that operation. The Venture Project is a facility that will act as the hub for the local and regional creative industries. Essentially, it is space that will house all of the resources and space needed for creative agencies and freelancers to set up shop. Beyond the for-profit sector, this facility will also house Dynamo Studios, Sound Corps, and other non-profit organizations that focus on professional development for creatives . This facility will connect local creative professionals with each other, and their craft with the world. The belief in the power of collision and connectivity is principled -- It is rooted in the belief that collaboration, cooperation, and education are the foundation of creative and economic success for creative agents and the local industries they represent. Everything this facility represents presupposes this belief. Through the Venture Project we will be able to turn the oftentimes fragmented group of creators in Chattanooga into a more concretely connected network of artists and professionals working cooperatively to better their work and realize desired industry or market opportunities. This cooperative ethos should and will become a hallmark of Chattanooga’s creative industry ecosystem, and as a hub of that ecosystem Venture Project will serve as the clear access point for those who wish to tap it for commercial purposes. 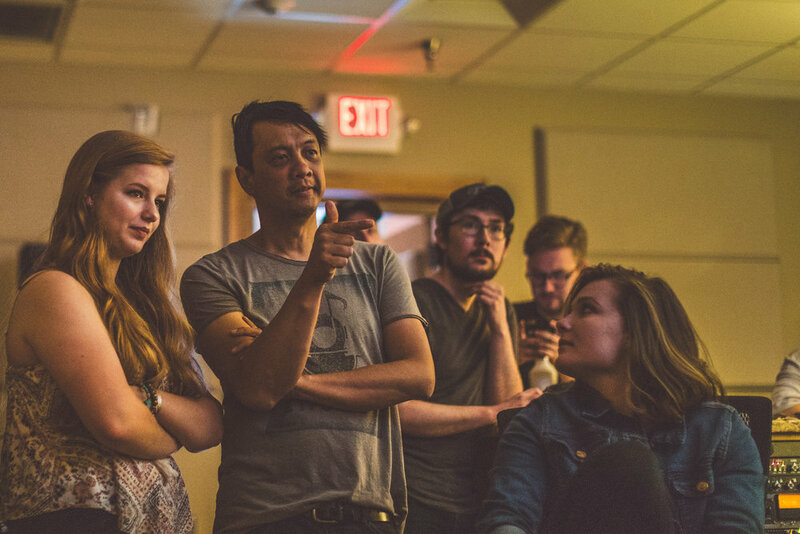 We unabashedly claim to work with the most talented artists doing music-related cultural production in Chattanooga, including not just musicians but a supportive network of filmmakers, designers, writers, and promoters. Although we are aiming to support the local creatives in Chattanooga, we are also wanting to create something that warrants creative professionals moving to Chattanooga to set up shop. It would be wonderful to have an operation like this supported solely by the current locals, but that simply isn’t realistic. In a more practical scenario we will house both locals and creatives that relocate to Chattanooga to participate in our growing creative economy. The main point here, however, is that Chattanooga must have resources like the Venture Project readily available to them. Through intentional connectivity we’re building a community of creative industry professionals and the infrastructure that makes that community accessible, productive, aspirational, and sustainable. We firmly believe that effective and impactful educational opportunities are the first step in building a better future. Education is the catalyst by which we believe growth and success are entirely attainable. Our programs will operate as apart of HCDE inner city schools and students’ free public education. Secondary programming will focus on afterschool sessions within our studio spaces, the library studio, and other community partner facilities that share our values. The program models we offer will be implemented as curriculum based educational programming that has a strategic student growth plan (career pipeline) in place for participants to follow as their expertise and technical skill set grows leading to professional opportunities within both the local music and creative economies. We are building this for the future generations of movers and shakers that will become part of the Chattanooga workforce following high school or graduation of a post secondary education program. Although our programs are focused on music and media production, our goal isn’t necessarily to churn out the next big music makers. Our goal is to churn out future community members that have reached “Self Actualization” by growing and mastering 21stCentury Skills through our programming and career opportunity pipeline. We focus on the professional fields in the music industry because music is a universal language that will engage anyone, no mater their race, gender, or economic background. For more detailed information, relating to the science behind our growth model please refer to the Dynamo Growth Model below. Dynamo exists to connect students to professionals in the music industry (be it musicians, producers, engineers, photographers, marketing directors, etc.) through engaging, real world learning opportunities. The problem facing many students is that a teacher’s ability to empower their students through professional experience is extremely limited. Many students don’t have any sort of real world professional experience beyond working as a waiter or waitress until well into their collegiate careers, assuming they go to college. Its even worse for those that don’t attend college because they will have to enter the work force with zero professional experience and nothing of any substance to include on a resume. Every teacher will agree that this experience is imperative to students longterm success inside and outside of the classroom, but unfortunately they are at the mercy of endless red tape, an extreme lack of funding, and an extreme lack of resources/support. In the average classroom, teachers can facilitate student growth that leads to students moving up each level of MHN until they reach self actualization. This is where leveraging growth becomes very difficult because reaching self actualization requires the application of student’s skills and content knowledge in a real world scenario. Yes, students can create projects, write papers, and complete tests, but the real growth world happens when students have to take ownership of their success by taking advantage of an opportunity to apply their skills (to the best of their ability) beyond the realm of an average classroom. Yes, students can reach Self Actualization via classroom practices, but it is extremely difficult and extremely inefficient to pursue student Self Actualization through that model. The Venture Project provides an environment and resources for professionals and students to harness their creative potential using the arts, education, and technology as a catalyst to promote cultural growth, community growth, and real world opportunities for participants at a free or reduced rate. We want to see our programs/facilities inspiring and empowering the students and creative professionals of Chattanooga to become elite professionals in the creative industries or whatever respective career field they represent, establishing Chattanooga as a hub for the creative industry and entrepreneurship. It doesn't matter who you are, everyone likes music and building off that common ground sets the stage for sustainable, tangible, long term growth for EVERYONE involved.